The deliciously subtle sweetness of snow crab married with the tangy bite of homemade ginger salsa. 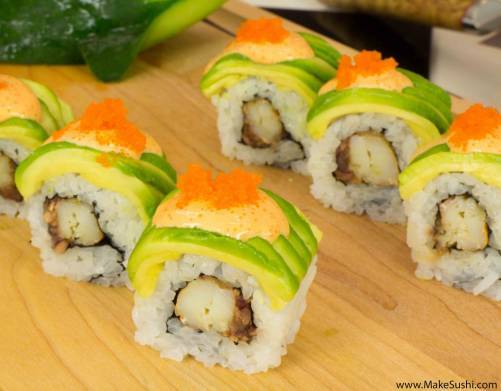 Chef Devaux’s Snow Crab sushi roll recipe is a must for those who delight in bold flavors. 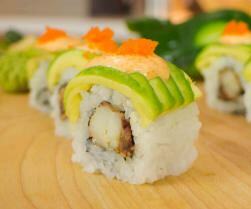 This relatively easy recipe is also a great addition to a sushi presentation that calls for a splash of color! Take a snow crab leg and, with your fingers, gently snap it in two at the joint. It should break quite easily, although you may have to use scissors to sever or trim off any tough tendons. Cut away the exoskeleton. Use nail scissors to minimize the risk of damaging the crab meat. Cut along the underside of the leg and make sure the scissors go through the exoskeleton rather than the meat. Do the same with the second crab leg. Put both pieces of crab meat on the cutting board. Lightly season each leg with sea salt. Turn the legs to ensure good, even coverage. After the salt, do the same with ground black pepper. Pre-heat a frying pan and add one or two teaspoons of clarified butter. Once the butter has melted, put the crab meat in the pan using a pair of cooking tongs. Lightly fry both sides for a few minutes until slightly golden. Use the tongs to remove the crab from the pan and set aside to cool. Put four tablespoons of (homemade) ginger salsa in a sieve. Strain for a few minutes over a container until there is minimal liquid left in the salsa mixture. Cut an avocado in half and remove the seed by slipping a spoon between the seed and the fruit. Remove the skin and place one avocado half cut-side down on the cutting board. Make slices of one to two millimeters thick. For a clean cut, use only the tip of your blade when slicing. Put a half sheet of nori lengthways on a cutting board. With moistened hands, transfer 120 grams of cooked white sushi rice to the sheet. Use your fingers to gently fluff out the rice, spreading it evenly to all four edges. Put the bamboo rolling mat inside a zip-lock bag and place it on the cutting board. Quickly flip the nori sheet over onto the mat, rice-side down. Spoon ginger salsa onto the nori – just enough to create an inch-wide strip on the length of the sheet. Put the two crab legs on top of the ginger salsa. Using your thumbs, quickly bring up the side of the bamboo mat closest to you. Curl it over the nori sheet. Apply pressure to the top with your fingers to keep it firm. 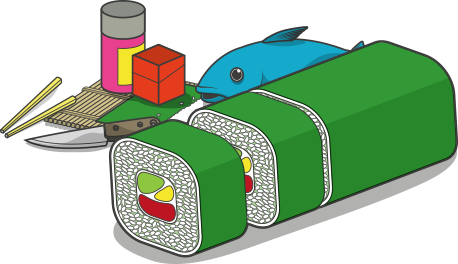 Remove the sushi roll from the mat, and position it vertically on one side of the cutting board. With the flat side of a knife, transfer the pre-cut avocado slices onto the cutting board. For ease of transfer to the sushi roll, position them parallel to it on the board. Use your fingers to gently fan out the avocado slices until they form the same length as your sushi roll. Lift them over on the knife blade and, holding it at a slant, use your fingers to gently push them onto the roll. Cut a small rectangle of cling film, roughly the same size as your rolling mat. Place the cling film over the sushi roll and cover with the rolling mat. As before, use your fingers to compress the avocado against the roll.When you remove the mat, the avocado should have taken the shape of the roll. If not, repeat this step but use more pressure to compress the avocado against the roll. Remove the rolling mat but leave the cling film in place. Wet the knife blade a little and slice off both ends of the sushi roll. Eat or discard these pieces. This roll will yield six pieces. First cut the rolll in half, then cut each half in thirds. Use the rolling mat to firm up the slices once more, prior to removing the cling film. Arrange the slices on a serving plate at a 45-degree angle. Squeeze or spoon a small quantity of spicy mayonnaise on each slice. Top with a little masago roe for a nice splash of color.